CPP's 500 Series power steering conversion gearbox is a modern alternative to the popular but outdated power steering box. 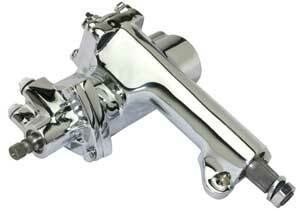 This 14:1 ratio unit is a direct replacement upgrade and works with the '605' conversion rag-joint. One of the many benefits of CPP's 500 Series box is superior directional control and road feedback, as well as a more stable feel to the driver. CPP engineered the recirculating ball gears for low friction and increased steering response. An open centered, rotary type valve provides smooth operation throughout the steering range while retaining excellent road feel. The old power steering boxes have a snap ring at the sector gear that inevitably causes leaks due to movement of the sector shaft. Our 500 box has a bolt-on cap that allows zero movement and a dependable, leak-free seal. Notice, too, that the mounting bosses are integrated into the casting, eliminating the need for an external bracket. Also, it will line up perfectly to your column without shims. This is the very best gearbox available to convert your Tri-5 to power steering.